Discover how you can make a high-impact investment in clean water. Celebrate clean water with the ones you love! Even at work you can help be the Voice of the Nation's River! Consider the many benefits of being a Potomac River Sponsor. Leave a legacy of clean water for future generations. A tax-wise method of making a lasting contribution to healthy lands and waters. 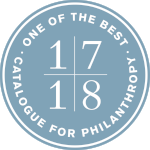 Potomac Conservancy is proud to be recognized in the Catalogue for Philanthropy as one of the region’s best nonprofits, meeting strict standards for effectiveness and financial management. We are also an accredited Land Trust, meeting the highest standards in land conservation practices.